Would I buy from them again: as of March 2011, no. 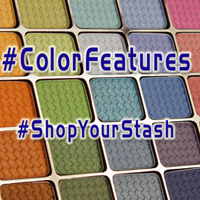 I would need to see colors that were unique to what I could find elsewhere, and / or would need to hear of increased product quality. I first attempted to order from this company in late December 2010, based on positive recommendations from other bloggers. I had repeated problems placing my order: first I had problems putting items into my cart, then when I succeeded at that my cart would empty itself when I tried to check out. I don't use Firefox or MSIE as my primary browser, so I am used to sites (like Paypal) suddenly not working as expected due to back-end changes to those applications. I launched Firefox and tried again - but again had problems. After trying for 30 minutes to buy the colors in the Auld Lang Syne collection and failing repeatedly, I took this as a sign that I should Stop Spending Money and surfed away. I tried to place additional orders from Evil Shades a few other times, only to close the browser window and decide to either buy something from another company, or to not buy anything. Finally I decided: since the Auld Lang Syne collection was marked as being discontinued, and I really did want some of those colors, I'd order two full-size jars of the shades I wanted. The web site is nice and straightforward: navigation at the top of every page (and there are actually some sites that forget that, believe it or not), text below the header and navigation bar. The content is on a white background, so it's both clearly set off from the page background, and nicely easy to read. There's a prominent notice about turnaround times right on the front page. The multicolored font on the front page lacks polish, but it's a -=readable=- set of colors. They didn't try to use cyan or yellow text on a white background. (And yes, I've seen online storefronts that have done that.) As for other site elements, I just want nice simple layout (check), easy-to-read text (check), easy navigation (check)...and no pages where all of the text is crammed over to one side or the other. I ran across several instances of that during my initial visits to the Evil Shades webstore. I'd first been attracted to the Auld Lang Syne colors when they were showcased on another blog. I don't recall seeing color swatches, but I did remember Lucia, that uber-bright red. I -=really=- wanted that red!! I went to check the color ingredients, and there was a single generic page listing all ingredients use in the various types of product. I couldn't see any ingredients for Lucia, specifically. I wasn't concerned about carmine as much as I was concerned: is this red eye-safe? An email sent from one of my generic accounts didn't get a response, even after waiting five business days. I would very much have liked to see the ingredients listed on the product pages. I also wasn't able to find quantity information beyond the fact that full-size eyeshadows were packed in a 5-gram jar. I dug around the site, read several general-information pages, but found nothing further than that tidbit. When my products arrived, the individual jars were sealed with electrician's tape. They were sealed with a small piece of black adhesive tape that didn't go completely around the jar, but did hold the jar lid firmly enough to prevent loosening or spillage in transit. I very much appreciate that the jars were individually sealed, especially as I've had some indie companies not seal their jars, but attempt to wedge them into a bag so that the jars won't move and the lids won't loosen...and this rarely works well. But...electrician's tape? There was also no information on the jars as to product quantity or ingredients. (If a company includes a slip showing what ingredients are in which products, I may give them a little bit of leeway in terms of having it actually on the individual jar or tube...but there was nothing.) There was a packing slip that listed my transaction number, the items ordered, and the quantity. I appreciated this, as it let me doublecheck that, yes indeed, everything was there (and remember what I ordered without needing to pull up my Paypal transaction history). However, that's all that was on the paper. It wasn't a full-size or even a half-size sheet of paper, either. This was a slip of paper slightly larger than a standard business card. Again, no information about product quantity per item. There was a business card in the package, with the Evil Shades logo, name, and URL. The small free-sample clamshell also had their new label on it. It's a nicely rendered logo, and while I have no idea how it was printed out it didn't look like it was done on an on-its-last-legs inkjet printer. The colors were bright, the lines were clear, and the sample name was printed - not written - on that little label. (Note to new companies entering the marketplace: That's an example of Doing It Right.) Contrast that label with the labels on the jars - nice enough, with the company and product name, with a seasonal/collection-specific graphic; but none of these older jar-labels were centered, and none of them were off-center in quite the same way. It was nicer than handwriting on a strip of white tape (which I've seen from other companies), and did show some polish with that green-wreath design; but compared to the new labels...no contest, the new labels look MUCH nicer. ES' latest rebranding looks to be well underway and getting off to an excellent start. I got four eyeshadows. (I did not get any of their lip products because I'm not fond of lip glosses.) The eyeshadows I chose are nice enough, but with the exception of Lucia, they're not really anything that I couldn't find at another vendor. The quality was about on par with some of Bare Escentuals' less-thrilling-to-me glimpses / "glimmers": the colors had very little shimmer at all, even the ones Evil Shades described as "shimmers". Aureate didn't seem to have much heft or opacity, either wet or dry. Wishing Tree was nice, but not breathtakingly unique in shade, pigmentation, or finish. Lucia was a bright, intense red with a slight magenta-blue tone to it - it looked good either wet or dry. That was the standout color, though. Filigree is nice, it's very similar to BE's Panther eyeshadow. The 5-gram sifterless jars were half-filled (or slightly more, in the case of Aureate) with product. Judging from these four colors, I'm neither thrilled nor unthrilled by Evil Shades. Perhaps when they've had time to do a little more polishing, both to their products and to their store & service, I'll try them again if there's something sufficiently eye-catching. I think that, as of March 2011, Evil Shades is newer company; and so in many ways they're still in learning and building. They're not brand new, though - they were having bloggers review their products as far back as December 2009, and I find this blogger's mention of them back in October 2009. (The domain evilshades.com was registered in August 2009 - though if they existed before that, they may have been on Etsy.) Knowing the company's age makes me a little surprised that they don't do a better, more conscientious job listing ingredients and product quantities - especially as they were in business during the start, and heyday, of the infamous Mineral Makeup Mutiny. Hopefully, they will begin including quantities on the web site, and the ingredients on the product pages rather than on one single generalized page as is the current setup. I'd also like to see them include that same information on either the product labels or packaging, as well - both because it's required by law, and because it gives the consumers more information. Evil Shades does seem to be headed in the right direction with their rebranding, adding a bit of polish all around. They've got a good new logo, and the new label I saw had sharp colors and an excellent print job. They've already reworked the web site, even since my purchase from them, to clean up the pages and general layout (no more textallthewaytotheright.) 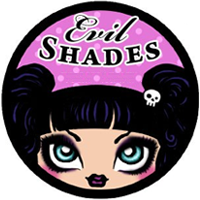 Evil Shades has a varied product line, with eyeshadows, blushes, bases, and lip glosses, so that gives them an edge as not many indie MMU companies offer much more than eyeshadows, blushes, and face powders - if they offer more than just eyeshadows. Their prices are not easy to judge, because I can't give a reliable cost-per-gram breakdown. However, seeing the fill levels on the jars I received and comparing them to Shiro Cosmetics and Fyrinnae, I'd say that they're a bit on the higher end of average / lower end of pricey for the quality and apparent quantity of their shadows - and will be even more so, with the price increases that have been mentioned. I may shop from Evil Shades again in the future if something catches my eye, but the quality of product I purchased doesn't make me want to regularly browse the site looking to see what new products they have, or subscribe to a newsletter. I would advise anyone with any sensitivities to contact the owner before making a purchase, especially since product ingredients are only listed on a generic "central" page, just to make sure that the product you want to buy doesn't contain anything that will cause problems for you.